He was living the American dream, but Faisal Shahzad gave it up to wage jihad and try to kill Americans with a car bomb near Times Square last May. In a pre-recorded video issued by the Pakistani Taliban, Shahzad recounted a spiritual journey that led him to give up a promising career as a financial analyst and become a terrorist just one year after becoming an American citizen. "I had everything in the world. I had a nice car. I had a house. I had an excellent job," he said. "They were paying me good money. But deep inside I always had this thought that there's probably more than this to life." He was raised in a moderate Muslim family, Shahzad said. It was only when he started studying on his own that he learned the significance of jihad. On Thursday, the House Homeland Security Committee holds its first hearing on radicalization within the American Muslim community. Critics have blasted the concept for singling out Muslim Americans. Ibrahim Ramey of the Muslim American Society – a group formed by Muslim Brotherhood members in the United States – likened the hearings to a modern-day McCarthyite assault. "What is likely to emerge from these hearings is not a deeper understanding of 'Islamic' radicalism, or even the legitimate exposure of threats to our security," he wrote, "but rather, another round of taxpayer-funded Muslim bashing that whips up even more divisive xenophobia and religious bigotry in the nation." In the past two years, however, FBI agents have stopped more than a dozen plots by Muslims in America to carry out terrorist attacks here and abroad. That includes the attempted bombing of a Christmas tree ceremony in Portland, and similar plots targeting a Baltimore Army recruiting center and the D.C. Metro system. A Chicago man even played a pivotal role in scouting targets for the 2008 terrorist attacks in Mumbai, India, in which more than 170 people were killed. Such plots were not happening with this frequency, if at all, three or four years ago. Since then, al-Qaida's effort to recruit Westerners has grown far more sophisticated. Charismatic Americans like Anwar al-Awlaki and Omar Hammami have made al-Qaida's message exciting and accessible to Westerners, Jarret Brachman, managing director of Cronus Global, testified during a March 2 hearing of the House Homeland Security Subcommittee on Counterterrorism and Intelligence. Online videos and the glossy magazine Inspire, which offers relatively simple suggestions for terrorist attacks and instructions on carrying them out, makes Islamic jihad "an adventure that kids can be part of," he said. "They are the proverbial Bat Light," Brachman said. "They shine the light into the sky and they convince American citizens that they can be Batman." On Thursday, two New Jersey men pled guilty to charges they tried to answer that Bat Light. Mohamed Mahmood Alessa and Carlos Eduardo Almonte admit they intended to kill people by joining the al-Shabaab terrorist group. According to their criminal complaint, the men were influenced both by Awlaki and Hammami. "Through covert recordings and their admissions today, Alessa's and Almonte's own words confirm they took steps down a deadly path," said U.S. Attorney Paul Fishman. "The defendants planned and trained for a mission that began in their New Jersey neighborhoods and would end with the murder of innocent civilians." Shahzad's case, however, offers a greater case study into the reasons why radical Islamist ideology increasingly is attracting people living comfortable lives in America. In the 40-minute video, Shahzad reads a series of Quranic passages justifying his actions. Muslims are humiliated and oppressed throughout the world because they have abandoned jihad – which Shahzad defines as "holy fighting in Allah cause [sic] with full force of numbers and weaponry." This has "utmost importance in Islam," he said, because "by jihad, Islam is established. Allah's word is made superior." It is as much of a pillar of the faith as fasting and giving charity, yet too many people fail to wage jihad. A series of attempted attacks inside America – and two deadly ones – show that homegrown Islamist radicalization is an emerging threat. Abdulhakim Muhammad, a convert, opened fire at an Army recruiting office in Little Rock, Ark., killing one soldier and wounding another. Muhammad told police "that he was mad at the U.S. Military because of what they had done to Muslims in the past." His attack followed a trip to Yemen where Muhammad studied at a radical madrassa and spent time in prison. At Fort Hood, Texas, Army psychiatrist Nidal Malik Hasan opened fire at a processing center killing 13 people and wounding 32 others. Hasan, like many homegrown jihadists, was influenced by Awlaki's sermons and even had direct contact with him. Awlaki also motivated five young men from Northern Virginia now serving 10-year prison terms in Pakistan. Led by a dental student, they disappeared just after Thanksgiving 2009, only to be arrested by Pakistani authorities as they tried to find their way to a battlefield and kill American soldiers. "We are not terrorists," Ramy Zamzam told a reporter. "We are jihadists, and jihad is not terrorism." No one is saying the current terror threat represents anything more than a sliver of the Muslim-American community. But the problem is growing and stands to do so dramatically if ignored. In the past six months, FBI agents thwarted a number of would-be plots, including several in which suspects thought they had built their own bombs, only to learn they were inert when they tried to detonate them. Shahzad would have killed people had he done a better job identifying the proper chemicals for his bomb. 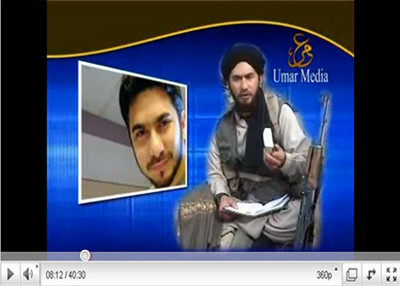 Toward the end of his video, Shahzad is shown embracing Hakimullah Mehsud – the Pakistani Taliban leader reportedly killed in a drone strike January 2010. He looks into the camera and calmly expresses his intent to wage an attack in Manhattan. He concluded by encouraging others to follow his lead, telling "my brothers, Muslim, living abroad, that it is not difficult at all to wage an attack on the West, and specifically in the U.S. and completely defeat them, Insha'Allah (God willing). Get up and learn from me and make an effort. Nothing is impossible if you just keep in mind that Allah is with you."